Take the road south from Kathmandu and you’ll find yourself on the flatlands that lie, like a sari’s silk brocade, at the fringe of the Himalayan foothills. I’ve been visiting the Terai for four years and with every trip I fall more deeply under the spell of the people and the landscape. There’s a sense of hiddenness about this place where lives play out far beyond the gaze of Kathmandu proper. On this bright October morning I’m traveling with a small rural development team based out of a leprosy hospital near Janakpur. My friend Mike rides up front, nurse Malati sits beside me, and team leader Arbind and his colleague Indra take the bench seats at the back. Our jeep bucks and sways as we lurch down a narrow dirt track. It’s thirty five degrees in the shade and a pall of dust covers everything: grass, trees, the notebook on my lap. The dust dances in the air like an amber genie released from a bottle. There is grit on my teeth, I feel it on my tongue. Soft grains coat my fingers. Nepal is on my skin, and beneath it too. We cross a river still swollen by late monsoon storms and tiny rainbows flare in the vehicle’s bow wave. My feet are suddenly cool as water leaks through the door seal. Where the road runs out, vehicles see hard service. After an hour or so we arrive at Pakariya and park up in the shade of a peepal tree. Known as Ashvattha in Sanskrit, these large trees are ubiquitous to the Terai. Hindus consider them sacred as do Buddhists. I love the way their heart-shaped leaves rustle in the slightest breeze. Women wait beneath the tree. They spread a blue tarpaulin on the ground as others wander down a sandy path to join us. Sitting here surrounded by people whose speech I don’t understand is a strangely restful experience. In this village they speak Mithila, a close cousin of Hindi. It’s a rippling, liquid language and for a moment I close my eyes and let the words wash over me. There’s been a death in the village and a funeral meal is being prepared in the courtyard of a mud-walled house. I watch as people take turns stirring a huge steel pot, the air becoming redolent with spices. Over by the jeep a woman hands marigolds to children. I assume they’re part of the cremation offering. Religion here is a Hindu-animist fusion. The wealthy can afford to anoint the bodies of loved ones with offerings of ghee and sandalwood and flowers, but where resources are limited, flowers alone suffice. A couple of years ago I helped make a film here, so I’m familiar with many of the faces I see in the crowd. The villagers return my gaze with expressions of mild interest but I suspect that in their eyes I’m worthy of no more notice than one of the goats that struggle to graze the thin grass nearby. A few minutes later I discover how wrong I am, for the flowers are both a welcome and a thank you, and somehow I’m included. Woven stools are placed under Mike and me, then we’re garlanded with marigold malas that hang heavy and fragrant around our necks. One by one children come forward and shyly place flowers in our hands. Soon there are too many for me to hold. Bright as fragments of pure Nepali light, they spill to the ground and lie at my feet as though pieces of the sun have broken off and fallen. Afterwards there are biscuits and hot, sweet chiya, Nepali tea, fragrant with cardamon and black pepper and served in elegant china cups. I’m aware of just how far these people have come in the past two years. On my first visit I was mobbed by wild eyed, ragged children. Now there’s a school and judging by the number of blue and white uniforms, even the girls are getting an education, a rare thing in these communities where sons are more highly valued than daughters. 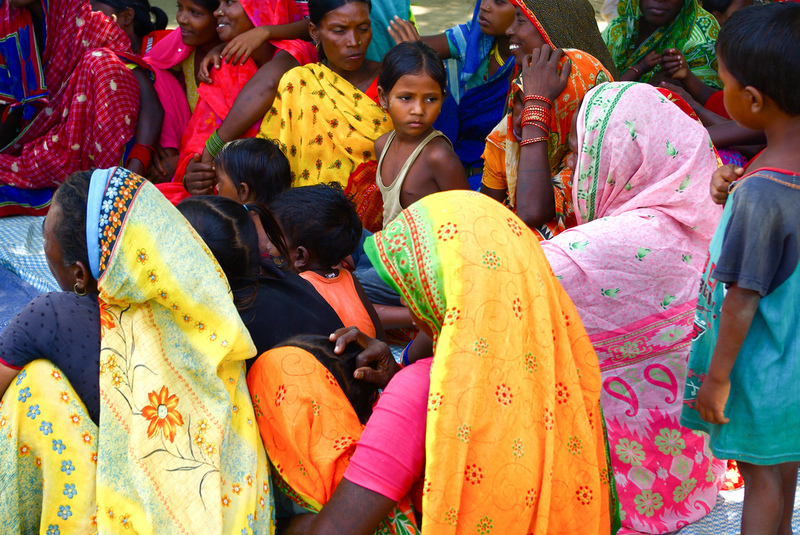 Once we’ve finished our tea Malati and the team gets organized, the regular weekly meeting commences; men on one side of the tarpaulin, women on the other. I break out my camera while the guys discuss farming and hand stained rupee notes to Arbind who carefully records each transaction in a ledger. So far the villagers have invested one lakh rupees (around $1,140) in the project’s micro finance program. The money is used for loans for things like fixing the roof on a house or buying medicine for goats. Despite the fact that everyone is on a tiny income, there have been no defaulters since the program began four years ago. In the women’s group Malati also collects money. These small denomination rupee notes represent not only the savings of this community, but its hopes for the future, hopes for education and a future for their children, hopes that they’ll be lifted out of the grinding trap of poverty. Dillip, the leader of the farmer’s group, catches my eye and grins. He wears a necklace of black tulsi beads, a sign that he’s taken a guru. That he can make such a choice and take time to think about spiritual and philosophical matters is an encouraging sign, a luxury that shows Dillip is living beyond mere subsistence. I smile when Mike points out the saffron-clad saddhu sleeping beside the jeep. It’s clearly guru day for Dillip. I remember a day during the filming when we set up the camera in the middle of the village and let it run. The idea was to capture the flow of life as it rolled on in front of the lens. Today the flow continues. There are boys perched high on the backs of water buffalo that meander down narrow lanes like mobile sofas. Women wash pots and pans, scrubbing them clean with a mix of ashes and water. A group of men take a bath at the water pump, bleached cotton loincloths clinging damply to their bodies. Nearby a grandmother prepares fish with scales like pennies flying and catching the light. 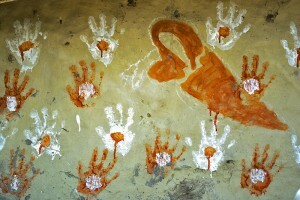 The ochre walls of her house are decorated with handprints and images of birds. I look around and notice similar artwork on other buildings. Earth shades are typical, though a house in nearby Station Thole sported a gorgeous turquoise and orange wall last time I was here. Beautiful in their simplicity, these traditional paintings are refreshed with a new coat of paint at festival time or to celebrate a rite of passage like the birth of a son or a marriage. I look beyond the sand-colored houses across acres of vivid paddy fields to where a girl in a crimson sari is a flame against the green. On the horizon a bullock cart shimmers in the heat, making its slow approach like a mirage from a forgotten, vanished time. Allison is a writer who spends her time in the UK and Nepal.